Wheatear chicks coloured ringed close to the nest. 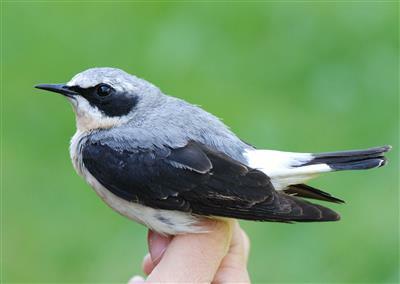 The Northern Wheatear is a migratory bird that comes in big numbers in April to the country. First to the southern coast and up to the mountains. This species is perhaps the passerine in the world that makes the longest move. From East Africa, through Siberia and all the way to Alaska. The Norwegian ones are probably wintering in West Africa. The Northern Wheatear breeds under the rocks or in the walls and enjoys being on the grazing fields with stones and short grass. The birds at Lista leave us early in September, while birds further north migrate through Lista in late autumn. The Observatory has been part of a national color ringing project for Northern Wheatear since 2013. The project is leaded by the Sunnmøre Ringing Group, and the goal is to learn more about its migration routes and wintering areas. The color ringing is carried out at the same time as the standardized ringing, and provides multiple readings that give us better knowledge of the local breeding behaviour on the breeding areas around the observatory and during migration. Since 2015 we have monitored the breeding Wheatears around the lighthouse, ringed adults and chicks, and registered the nests and fledglings found in the area.